Seeking skip hire solutions in the Cape Town vicinity? Bins 4 U offers a variety of bins for hire, as well as expert removal services. Once finishing a renovation or building project, it is always nice to take in and appreciate the work that has been done. Unfortunately, a building project always leaves a lot of waste and rubble, that many people are not sure how to get rid of. 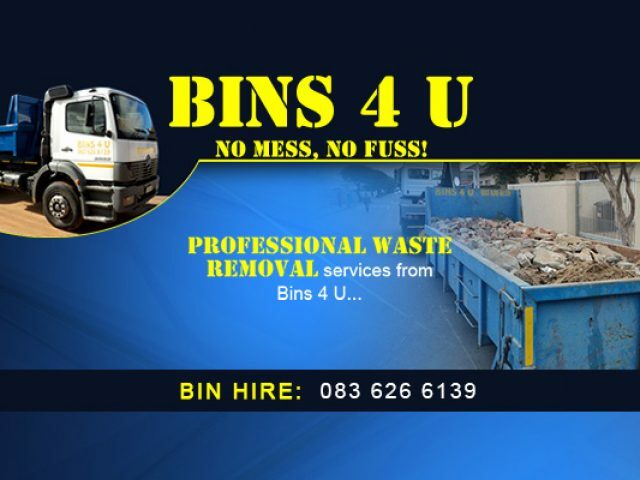 Do not stress - there are tons of companies that offer skip hire in Blouberg and nearby areas that will take care of the removal of any kind of waste on your behalf. The types of waste that these companies are able to remove, include almost anything you can think of, such as building rubble (stones, plaster, nails, etc. ), factory waste, garden refuse (such as large tree branches, leaf litter, etc. ), and even large heaps of sand that is left over after the completion of a building project. The workforce at the various companies make use of advanced equipment and methods to get rid of your waste in the minimum amount of time. If you have been wondering what to do with that excess waste in your yard, no matter what kind, be sure to contact one of the listed compnaies below, for reliable waste removal and skip hire in Blouberg.